The seemingly straightforward task of trying to book a hotel can turn into a complicated ordeal if you're not sure how best to go about it. Just choosing from the large number of booking sites out there can be a puzzling undertaking in itself. On top of that, successfully deciphering all the different deals each company advertises, and figuring out which deal will stretch your travel dollars furthest can be migraine-inducing. Luckily, there are a few ways to make your accommodation booking easier and ensure you get great deals every time. Here's how to save money and avoid headaches by using the best hotel booking websites. By signing up, you also usually become a member of whatever their loyalty program is, opening up even more potential for rewards the more you use them. Agoda, for example, currently offers 5 percent off your first trip when you create an account, as well as access to their Insider Deals, which can save you up to 30 percent on selected properties. Booking.com offers Secret Deals, allowing you to see lower prices as soon as you sign up, which is similar to Expedia's offer of Member Pricing. Many people use booking sites by simply inputting the destination they're headed to, their check-in and check-out dates, and the number of guests. This method will provide you with all the properties available, but sifting through hundreds of options can be a tedious, time-consuming, and confusing process. If you've never used the sort functions, or you aren't using them properly, then you're undoubtedly wasting a lot of time and effort each time you look for a hotel. All booking sites have variables that allow you to quickly narrow down the results. You can filter based on exactly what you're looking for in your accommodation. Each site has its own filters, and whether you want to only see hotels with an on-site gym, free parking, or a balcony is entirely up to you. But one filter that you should definitely be using is to sort by the guest rating. In my experience, these will give you a great indication of the standard of a property as judged by previous guests, rather than what can sometimes be an arbitrary five-star system. It's always best to start with the highest rating and work down if necessary, as this will filter out a large number of the results. Once you have your shortlist, you should thoroughly read the written reviews guests have left as they may alert you to details that aren't immediately obvious from the description. Referral programs are always a good way to save yourself some cash, and they usually require very little work. Some of the major booking sites have competitive referral programs, though they regularly change their offers, so it's worth checking each site for up-to-date details. Booking.com currently offers a refer-a-friend deal, and all you have to do is send your friends the link to sign up. Once they've booked and completed their first stay, you'll get your reward paid onto your credit card or directly into your bank. Your friends who use it will also receive the same bonus after their initial stay. For each friend you refer, you'll both receive a bonus, and you are allowed to refer up to 10 friends. This means you can make enough to cover a night or two in a hotel by simply sending an email. To get customers to use their mobile apps, some of the big booking sites offer incentives to download and book through them. 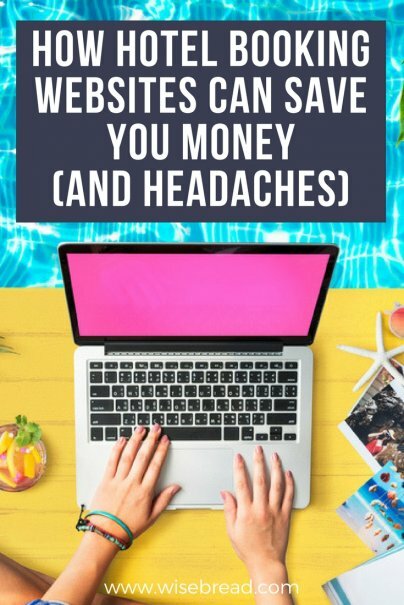 This is great because it's virtually the same process as doing it on a computer, but you'll be getting added savings simply for using their free apps. I also find that the apps are handy to use as they allow you to search and book your accommodation while on the go, which is how I make the majority of my bookings now. Expedia currently offers double Expedia points as well as up to 40 percent off on deals exclusively available on the app using a mobile device. Hotels.com offers Secret Prices when you download their app, while Agoda promises their cheapest prices on the app, as opposed to their website.